From left: Bailey Boardman, Cadyn Jarvis and Jonathan Cole work on stacking library books. The activity was inspired by the opening scene in Mary E. Lambert's book "Family Game Night and Other Catastrophes" (displayed at the front of the stack). The Vermont College of Fine Arts is located in Montpelier, Vermont. Author Mary E. Lambert is a graduate of the school's MFA program in Writing for Children and Young Adults. The author, an Arizona native, experienced her first winter weather while she was here. "I had two winter residencies in January, so those were my first real taste of a true winter, I think," she said with a laugh. "Just a short taste." But Vermont winters aren’t anything new for Dorothy’s List readers at the Chelsea Public Library, less than 25 miles away from where Lambert was working on what would become her debut novel. The exterior of the Chelsea Public Library, where we caught up with Dorothy's List readers to find out their questions about Mary E. Lambert's book. That’s where we found a group of readers who had some questions for the author, including this one from an 11-year-old reader. Bailey Boardman: "How many books have you written?" "So then, I tried writing another and another. And that’s when I realized I needed some help and I decided to do the Vermont program. And then since I graduated from there, I have completed three others. But they all need quite a bit of revision. I tend to be someone who gets really excited about writing that first draft, and a little less excited about going back and fixing all the problems." Twelve-year-old Annabelle is the main character in Family Game Night and Other Catastrophes, and she has some problems of her own to fix. She lives with her parents, younger sister and teenage brother. But she hasn’t had any friends over to her house since her 10th birthday party. In fact, she won’t befriend anyone within a five-mile radius of her house, because she doesn’t want anyone just stopping by and discovering her secret. Annabelle’s house is overflowing with stuff. Her mother is a hoarder. And she’s determined not to let anyone find out for fear they would label her, or pity her or — worse — take her and her sister Leslie away from their family. From left: Caydn Jarvis, Jonathan Cole and Bailey Boardman work on their library book stack - they would carefully take one book away at a time to see if the stack would hold its balance. In the opening pages of the book, a stack of newspapers that Annabelle's mother has been collecting in the house falls on Leslie during breakfast. Annabelle describes the teetering stack as being like a Jenga tower. That scene inspired Chelsea children’s librarian Ashley Jamele to make up a Jenga-style game with her Dorothy’s List readers. They stacked library books into a tall tower, then took them away one by one. And, finally — a crash. And then clean up. Cleaning up is a big theme in the book too. Annabelle’s entire house is loaded to the rafters with broken toys, camping equipment, canned goods and empty egg and milk cartons. But not Annabelle’s room – it’s downright sparse. And she is meticulous about making sure it stays that way. One eight-year-old wanted to know if that’s the way Lambert grew up too. 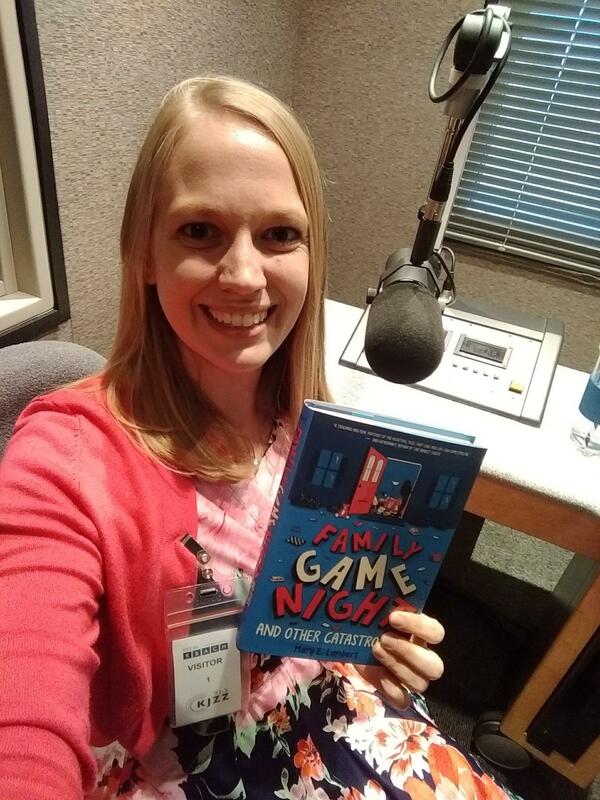 Mary E. Lambert is the author of "Family Game Night and Other Catastrophes." Mary E. Lambert: “So my mom is actually the opposite of Annabelle’s mom. She likes to keep things cleaned out. And I’m the person in the family who’s more like Annabelle’s mom, where I like to save things. And when I was younger I went through a phase where, like, I wanted to save every candy bar wrapper and I didn’t want to throw any of them away. And I know that’s like a silly, not logical thing to want to do, but the idea of throwing them away made me feel very anxious. "And so as I grew older, I felt like I could understand that desire that Annabelle’s mom had, not to let go of things that she really needed to let go of. And so as I wrote the book, I think I kind of flipped my mom and myself, where I’m a bit more like Annabelle’s mom and Annabelle is more like my mom." After the falling newspapers incident, things go from bad to worse. Annabelle’s grandmother comes to help try to put their house – and their lives – back together, but it's a tense situation. There’s a point in the book where Annabelle’s grandmother tells her that everyone is broken in some way. And that got Jonathan’s attention. Mary E. Lambert: “Well, Jonathan, I think the easiest way to explain that would be, do you have any scars? Did you ever fall down and cut yourself, and then when it healed it left a little scar? … I don’t know any adults who don’t have a single scar, whether, you know, they had a little wart removed when they were a kid or they cut their knee badly. "And life is like that where, as you grow up things will happen and you can heal and you can be better or stronger. But we’re all gonna have those little scars or something difficult that has happened in life. And sometimes it can make us better and stronger people. "And so I wanted this book to be a book that’s hopeful — that there are hard things and there are sad things that happen, but we can overcome those things. And I think stories should give us hope." 11-year-old Bailey Boardman eyes the growing stack of books on top of a table at the Chelsea Public Library. One 10-year-old has some questions about the work Lambert put into the creating this story. Caydn Jarvis: “How long did it take you to write the book?" Mary E. Lambert: "Well, the first draft of the book, Caydn, it didn’t actually take very long at all. I wrote it, probably in about three months — which for me is pretty quick. "But then, there’s a saying that ‘writing is re-writing.’ So once I had a first draft done, then I re-wrote it five or six more times. I kind of lost count in there." Still, Lambert says she finished it in under a year. Mary E. Lambert: "One of the things that did help me get this one done more quickly is that I was still doing a school program through Vermont College of Fine Arts, and so I had guidance from like a mentor author who was working with me and then a different one who helped me do the re-writing." In addition to that re-writing step, Caydn was curious if there was also a research component. Mary E. Lambert: “I did do a lot of research. I went to the library and checked out all the books that my local library had about hoarding and obsessive compulsive disorder, because the two are very related. And then I also thought a lot about my own life, because there have been times where I’ve like really wanted to save things or made things sentimental that should not be. And so I drew both on personal experience, and then also off of the books that I had read. And then, of course, I read a lot of newspaper articles and things like that." "One thing that I did not do, that a lot of people think I did, is watch the show. There was a show on cable about hoarding … and I really tried to steer clear, actually, of watching the TV show." From left: Caydn Jarvis, Jonathan Cole and Bailey Boardman observe the aftermath of their book tower collapse at Chelsea Public Library. And Bailey has one more question for author Mary E. Lambert. She’s hoping for a chance to read more about the characters in Family Game Night and Other Catastrophes. Bailey Boardman: “Have you thought about writing a sequel to this book?" Mary Lambert: "That is something I have thought about, but I don’t think I would write a sequel. I like the characters to kind of live on in the imagination of the reader. And I like when books leave things a little bit open so you can make some of your own ideas about what would or should happen next, and where you think the story is going. "At the same time, there is a minor character in this book, Annabelle’s friend Amanda, that I think has a pretty interesting story. So, there have been some times where I have thought that maybe I would like to return to that character and tell her story. And Annabelle would be in it, because they are friends, but it wouldn’t really be a book about Annabelle or her family." So, Dorothy’s List readers, you’re just going to have to decide for yourselves how Annabelle and her family move on after the story ends. Special thanks to Chelsea Public Library children’s librarian Ashley Jamele. Next month we’ll learn about The Whydah: A Pirate Ship Feared, Wrecked and Found by Martin Sandler. Ask your librarian for a copy so you can read along.